I’m frequently asked if there is a creation explanation for the geology of such-and-such a place, and that keeps me exploring locations all over the world. The latest request was for the Canary Islands. While I have ‘your ear’, a question from left-field. My wife and I have just returned from a week in Tenerife in the Canary Islands and were fascinated looking at some of the volcanic formations there. Is there any sort of Creationist resource that I could tap into to learn some basics of geology? I’d love to be able to make more informed comments when the question of geology arises! There are a number of tools that help you appreciate of the geology of any area from the biblical perspective. Figure 1. The geological column is a record of Noah\’s Flood which occurred about 4,500 years ago. It needs to be interpreted properly. Most of the column was deposited as the floodwaters were rising on the earth. The dates of millions of years shown on the left side are not correct but retained so you can locate any rocks you read about onto the column. You need a big picture appreciation of how mainstream geology, as presented on the geologic column, translates into biblical history. The article Aronofsky’s Noah will stimulate biblical geology describes the relationship briefly. The figures in that article gives the broad overview. 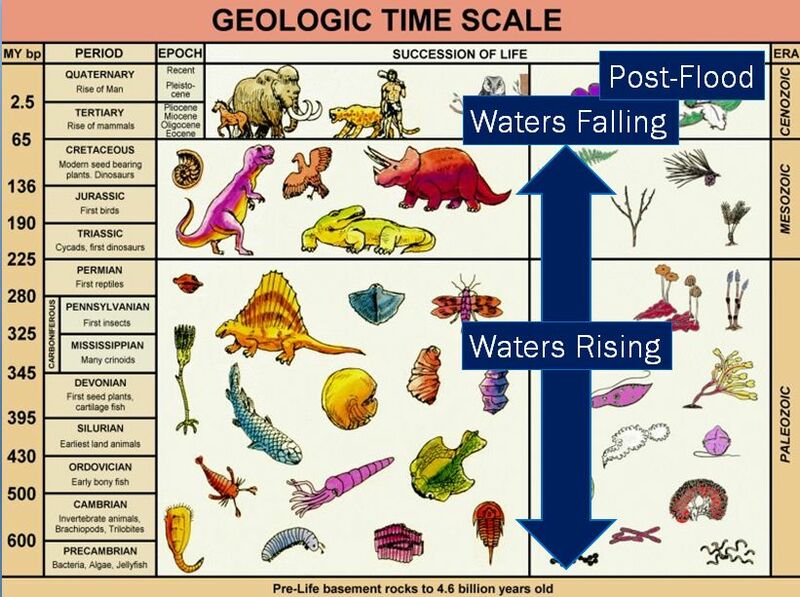 The pertinent figure is reproduced above as figure 1, showing the Flood water rising, Flood water falling, and the post-Flood era. Bear in mind, as the article explains, there is not necessarily a one-to-one relationship between rocks on the column and biblical history because the geological column does not classify rocks by the same criteria as for biblical geology. However, it is a good first step. Also appreciate that there is a difference of opinion among creation geologists and that article presents the position I have come to over the years. Hopefully you find my reasoning compelling. Use Google to look up geological reports, tourist information, geological maps, and geological blogs. Most of the work has been done for you. Check where mainstream geologists have placed the rocks and then find where that fits on figure 1 on the geological column. 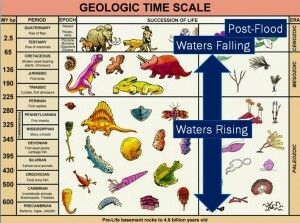 This will help you see how it relates in the big picture and understand what sorts of rocks are involved. Often geological reports have suitable maps in them. This will give you a good understanding of the geographical shape of the place. Zoom in and zoom out. Use satellite view. For the Canary Islands a Google search brought up a couple of geological articles: a comprehensive geological report,1 and a blog by a geologists with lots of good pictures.2 If I had more time I could check a lot more material to do a more thorough job. Figure 2. 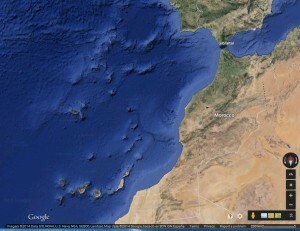 Google map of Canary Islands off west coast of Africa, toward the bottom of the map. On Google maps (figure 2) you can see the islands sit off the west coast of Africa, with a similar volcanic ‘chain’ to the north running toward Spain, but mostly submerged under the ocean. You can see that the islands stand out as separate ‘cones’ above the ocean floor, and that they have steep sides. This suggests that the islands are of volcanic origin, and that eruptions occurred after the ocean crust was in place. You can see that the islands have flat tops, and this suggests their landscape was smoothed flat by the ocean, and that they erupted when the water level was higher. The geological reports say they are volcanic islands, and that agrees with our first thoughts from Google maps. The Traveling-Geologist blog has some good photos of the volcanic lava and ash. These islands would have erupted after the ocean floor was surfaced and likely when the ocean level was relatively higher than today. 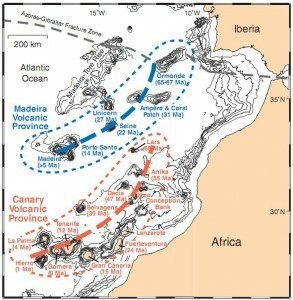 The geological report comments on the linear arrangement of the volcanic islands in each chain, and interprets this as due to a hot spot moving under the ocean floor (figure 3). They report that the islands have been ‘dated’ from 68 million years to 1 million years. This progression of ages matches the idea of a hot spot moving under the ocean crust over tens of millions of years. However, there has been some scepticism of the idea of hot spots including the most famous example, the Hawaiian Island chain. It is possible that the reported progression of ages could be an artefact of the sampling and selection of radioactive ‘dating’ results. Note, that modern day volcanoes give ‘dates’ of millions of years for lava erupted in historical times, indicating that the argon was incorporated into the lava when it solidified. The eruptions on Mt Ngauruhoe in New Zealand have been dated at millions of years and there are many other examples. 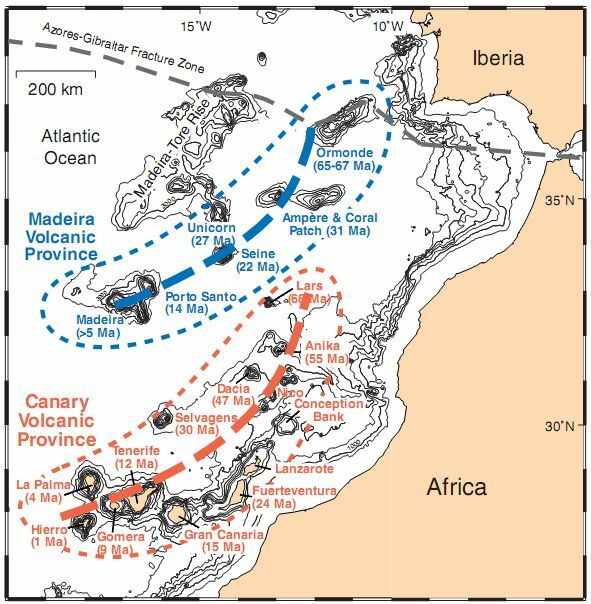 The age of volcanism in the Canary Islands is well known from radiometric age dating. More than 600 K/Ar, Ar/Ar, and 14-C ages have been obtained by different groups on igneous samples from the islands. There have been a number of problems, however, primarily in dating older volcanic rocks and the uplifted portions of the seamount formations, some of which are clearly affected by alteration. Samples with excess Ar have produced ages that are too old, artificially increasing the duration of the basaltic shield stage on the islands. It is worth noting that there have been a “number of problems” with the dating. It is also worth asking how they knew samples were “clearly affected by alteration”. It could not have been obvious when they collected the samples or they would not have analysed them. It is also worth asking how they knew other samples had excess argon. It seems likely that they decided the samples gave the wrong ages after they got their results back! In other words, they knew what answer they wanted. That is why I wonder if the progression of ages is as real as indicated. Now that we have checked the various geological reports and maps we can interpret these islands. There are two aspects that are of interest: 1. The rocks that actually form the islands, and 2. The shape of the landscape, with its mountains, valleys, beaches and coastlines. I would interpret the Canary Island as forming from volcanic eruptions as the waters of the Flood had been receding for a while. These eruptions also continued in the post-Flood era, and volcanoes are still active on the islands. The modern ocean floor appears to have begun forming after the floodwaters peaked. (See Geologists see effects of Noah’s Flood in Africa and The breakup of Gondwana revealed in the geological cross section through Perth, Western Australia. The flat tops on the islands would possibly have been shaped by erosion of the ocean when the sea level was higher, relatively. I suspect that the islands formed along fractures in the ocean crust and that the progressive eruption was due to changes in pressure across the ocean floor, either dur to movement of the continent or magma pressurization and release from an underlying magma chamber. This would explain why the eruption points move along the fractures/weaknesses. This could also provide an explanation for the progression in ‘dates” of the islands, being due to progressive degassing of the mantle that incorporated argon gas into the magma with varying isotopic composition. The Tamu Massif provides another example of the sort of volcanic eruptions that occurred as the ocean floor was sinking in the second half of the Flood. The recently-formed Surtsy could provide a suitable modern analogy of the formation of the Canary Islands. The explanation I have given above provides the big-picture framework for the understanding of the Canary Islands—how they really formed as a consequence of Noah’s flood. For the detail, you will be able to find lots of geological reports that illustrate the local geology which you can visit when you are there. The one by the Traveling Geologist is a good example with lots of pictures. The report by Hoernle and Carracedo has excellent coloured geological maps of each island in considerable detail. You can print them out and use them when you visit the islands and know what you are looking at. You just need to retell the story within the framework of the biblical history, which is not difficult. Hoernle, K., and Carracedo, J-C., Canary Islands, Geology, In: Encyclopedia of Islands, ed. Gillespie, R.D. and Clague, D.A. University of California Press, Berkeley, California, USA, pp. 133–143, 2009. PDF. Spencer, C., The Canary Islands – Tenerife, The Travelling Geologist, 7 August 2012. Canary islands, as well as many other Atlantic Ocean islands, are volcanic. Read my book : “Darwinland” in internet.